We are thrilled to announce our capital campaign to fully renovate 121 East Lake St and set the stage for the return of our beloved Colorado State SigEp Chapter. The early response for SigEp brothers has been tremendous and we have reached $1.1M in gifts and signed pledges! Thank you to all brothers and friends who have supported the campaign. Want to learn more about the project to transform our 121 East Lake home? Read the Announcement Newsletter that brother Dan Reagan '82 put together for an introduction to the project, and to recognize the brothers who got this campaign off the ground. Hear from brothers Trevor Armstrong ’99 and John Clark ’65 on why they are supporting the Campaign for Colorado Gamma. 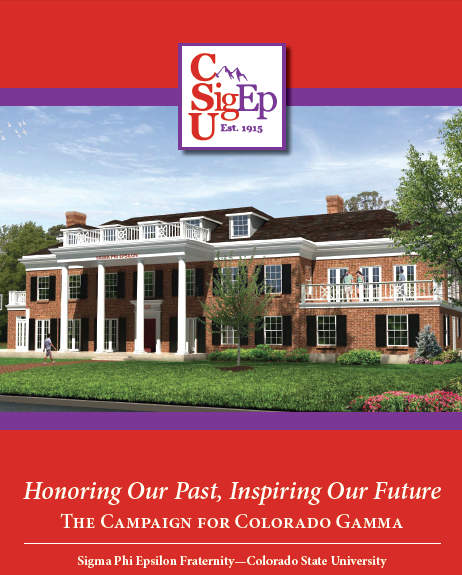 Check out the Campaign Brochure that outlines the vision for our project and the future of CSU SigEp. Take a look at the conceptual design plans brother Mitch Christ ’79 presented to the City of Fort Collins and read about our renovation approach that honors and preserves the history of our chapter house while adding innovative and forward-looking capabilities. You can have a huge impact on the Campaign for Colorado Gamma right now!.. Questions, comments, or suggestions about the Campaign and Renovation? The Campaign Board would love to hear from you. Send us a note, reach us on twitter @CSUSigEp, or reach Campaign Chairman Al Hornung '61 at 303-880-7892.